Albacore tuna season is from June to October. Seafood Inc provides millions of pounds of albacore tuna every year. Albacore tuna is great for canning. You may pre order before June for fresh tuna. We also have frozen albacore tuna twelve months a year. Sashimi grade albacore tuna is also available. A true sashimi tuna is frozen at sea. Make your next barbeque a special one with a fresh albacore tuna delivered to your door. Looking for sashimi grade albacore tuna? Seafood Inc purchases millions of pounds of frozen at sea sashimi grade albacore tuna every year. Fresh albacore tuna is also available June through October. You may order any time during the season, or pre order November through May. 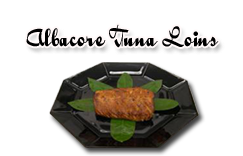 Seafood Inc also carries albacore tuna loins. All albacore tuna is troll caught, high in omega three and excellent for canning or barbequing. There is no comparison to store bought tuna. As a fresh albacore tuna supplier we ship fresh and frozen albacore tuna worldwide. Seafood Inc is dedicated to superior quality of its frozen and fresh albacore tuna.